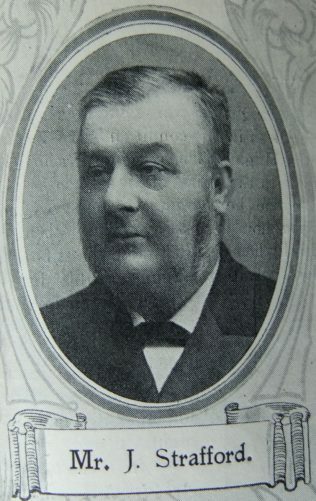 Mr. James Strafford, Senior Steward of the Leeds First Circuit, has held the position about twenty-four years. For thirty-six years he has been a member of our Church, during thirty-three of which he has been connected with Quarry Hill Chapel, first as organist, and later as choirmaster, a position he still holds. As a youth he was apprenticed to the late Mr. John Parrott, “The Primitive Methodist Printer’” and over a quarter of a century ago succeeded him in the business, and today is one of the best known Primitive Methodists in the city of Leeds. He has represented his circuit a few times in District Meeting, and has twice been a delegate to Conference. Mr Strafford is thoroughly loyal, a generous supporter, and keenly interested in all Connexional movements. In all his good works he is ably seconded by Mrs. Strafford, and both are regular and punctual attenders at the means of grace. A daughter is the wife of Rev. A. Jubb. James was born on 9 August 1845 at Churwell, nr Leeds, Yorkshire, to parents William and Elizabeth. William was a coal agent. James was baptised on 19 October at the Wesleyan Methodist Church, Churwell. Removing to Leeds as a boy, James was sent to a Baptist Sunday school, where he remained until he was nearly thirty years of age, serving for several years as organist of the church. Then he became organist at the old chapel in Bryon Street before moving on to Quarry Hill. Census returns describe James as a music and general printer. James married Rachel Ann James (1845-1919) in early 1870 at Leeds, Yorkshire. Census returns identify four of six children. James died on 26 November 1913 at Leeds, Yorkshire.